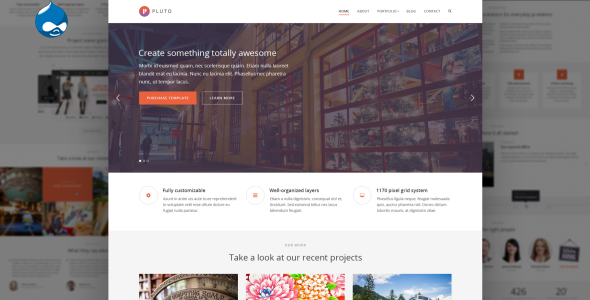 Pluto is the awesome Responsive Drupal Theme : Onepage & MutiPages created for corporate and portfolio websites – business site needn’t be boring. It features a very clean and minimal design that is perfect for showcasing your work. Pluto Built with Bootstrap 3! The theme is For Drupal 7++ With Unlimited Colors via theme settings. 20 HD Videos tutorial in the documentation shows you how to install the theme for existing drupal installation. Full demo package for new fresh drupal installation. Bonus one HD video tutorial for this one. Responsive Layout, Compatible with Bootstrap 3. Onepage , and MultiPages supported. Submenu support 3 levels. Tabvn: Drupal LayerSlider: This is awesome Drupal slider only at Tabvn. Tabvn: Drupal Drag and Drop Page builder, Awesome Drupal Module. Tabvn: Views isotope , Timeline for views plugin style. Support auto pager (auto loading more content via ajax when page scroll). Parallax background image. (select image and upload ajax via Tabvn: Page Builder). Alot of Portfolio layout styles. Flickr , Twitter feed widget supported. Item Reviewed: Pluto Creative One page & MutiPages Drupal Theme 9 out of 10 based on 10 ratings. 9 user reviews.